ওরা জিজ্ঞাসা করলে, কী কাজ আপনি করেন? তোমাদের কর্তারা আমাকে রাখবেন কেন? মুশকিলে ফেললে দেখছি! যদি সেক্রেটারিবাবু আমাকে পছন্দ না করেন? The name of the teacher newly appointed to the school was Kalikumar Torkalonkar or Black pumpkin, fresh chillies as the boys called him. The gentleman answered, ‘It is very crowded, there is hardly any space; I will be out of your way in this corner.’ He then moved from their bench and spread his mat on a corner of the floor. The gentleman saw that the pot that had held sweets was empty and the one that had puffed sweet rice had not a grain left. Those had contained a few mangoes from his own garden. The boys soon became quiet when they saw he would not get angry no matter what; there is little fun in teasing someone who will not get annoyed. The boys got on the train. A little later a sweetmeat vendor arrived at their carriage accompanied by the old gentleman. The boys all called out Hurrah! Then the mango seller came with his basket – there were mangoes too at the feast. He then bent down to pay his respects. This entry was posted on October 1, 2014, in Uncategorized and tagged ইঁদুরের ভোজIndurer Bhoj/ A Feast for the Mice, Rabindranath Tagore's short stories. The aunt left after saying this. Moni remained lying on her bed fuming at the injustice. ‘Look at what is happening, it is the rice ceremony for my only sister and these people are not letting me go! This entry was posted on December 13, 2013, in Short Stories and tagged Rabindranath Tagore's short stories, Shesher Ratri. কোথা হইতে এক চক্ষুখাদিকা, ভর্তার পরমায়ুহন্ত্রী, অষ্টকুষ্ঠীর পুত্রী উড়িয়া আসিয়া জুড়িয়া বসিবে, ইহা কোন্‌ সৎকুলপ্রদীপ কনকচন্দ্র সন্তান সহ্য করিতে পারে। যদি-বা মরণকালে এবং ডাকিনীর মন্ত্রগুণে কোনো-এক মূঢ়মতি জ্যেষ্ঠতাতের বুদ্ধিভ্রম হইয়া থাকে, তবে সুবর্ণময় ভ্রাতুষ্পুত্র সে ভ্রম নিজহস্তে সংশোধন করিয়া লইলে এমন কী অন্যায় কার্য হয়! When the doctor left saying there was nothing more that he could do, Gurucharan’s brother Ramkanai sat next to him and said slowly, ‘If you wish to make a will tell me so.’ Gurucharan said weakly , ‘I will speak, please write everything down.’ Ramakanai gathered pen and paper as Gurucharan started saying, ‘I leave all my moveable and immoveable property to my lawfully wedded wife Madam Borodashundori.’ Ramakanai did write this down but his pen seemed to take forever. He had hoped so much that his only child Nabadwip would inherit the entire estate of this childless uncle. Even though the two brothers had separate kitchens, his wife had prevented Nabadwip from taking up any gainful employment in this hope and had married him off rather early. To the dismay of their enemies the marriage had also been fruitful. But he still wrote everything down faithfully and handed the pen to his elder brother for his signature. Gurucharan’s scribble was so faint that it was hard to understand whether it was his name or a few shaky lines on the paper. When his wife did come after finishing her meal, he was no longer able to talk and his wife started weeping. The people who had greatly wished for a windfall all said she was pretending but that is not true. Gurucharan had never believed in any of these things. He had been a student of Mr Duff’s. He took great enjoyment in doing the things described as taboo in the Scriptures. If people called him a Christian, he shook his head and said, ‘Then I must eat beef.’ The person who had been like this all his life could hardly be expected to be disturbed by threats to the funeral ceremony now that he was newly dead. But there was no other way of taking revenge on him. Nabadwip was mollified by the realisation that his uncle would never come back to life again. Even without his uncle’s money he would be able to subsist for the rest of his days, but his uncle was now in such a place where one could not find a thing even if one begged for it. There is much to be said about being alive. She grew more and more annoyed as she discussed this future misbehaviour. Ramkanai knew for certain that if he said anything to assure against these outlandish imagined fears, it would only get worse. He hence stood there looking guilty as though the deed had already been done and he had died and deprived ‘darling Nabadwip’, giving everything to his second wife! There was nothing to do but admit to the offence. in the meantime Nabadwip consulted his clever friends and came to his mother saying, ‘There is nothing to worry about. I will have it all. We have to get my father somewhere else for a few days. If he stays things will not work out.’ His mother had no respect for his father’s sense either and this seemed a logical thing to do. In a few days, this extremely unnecessary, foolish, obstinate man was packed off to Kashi for a few days on some excuse. The two continued to trade playful insults for a long time. Gradually the insults became complaints that were directed against the other’s gender rather than the individual. 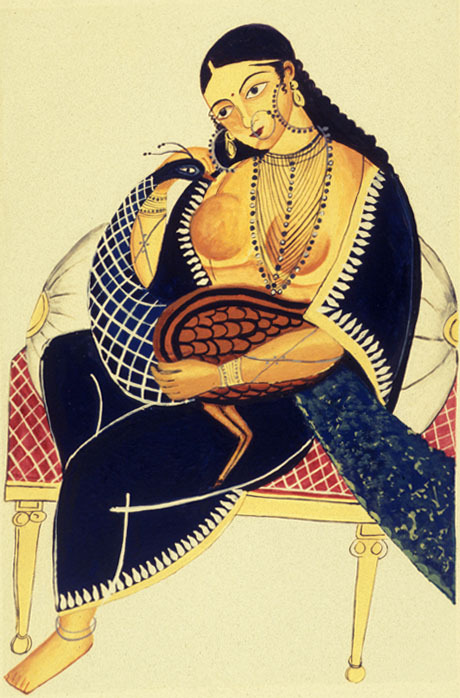 Nabadwip’s mother compared the love in the hearts of men with the love of a Mussalman for chicken*. Nabadwip’s father said, ‘Women have honey on their lips but blades in their hearts’- although it is hard to say when if ever he had received proof of these honeyed words. What golden, deserving descendant can bear it when a rapacious, husband eating, daughter of evil comes out of nowhere and takes it all. If a foolish uncle loses his mind thanks to death and the spells of said witch, then why is it wrong for the faultless nephew to try and correct the wrongs himself? Ramkanai was astounded to see that his wife and son had joined forces in alternately berating him and shedding tears, he struck his forehead in shame, refusing to eat or even drink water. After two days had passed in this silent fasting, the day of the trial arrived. Nabadwip had managed to lure Barodashundori’s cousin with such promises and fear that he gave witness in his favour without any qualms. When victory was about to leave Barodashundori and move to the other side, Ramkanai was summoned to the witness stand. Weakened by hunger, the old man gripped the stand with his trembling thin fingers, his lips and tongue dry as though he faced the gallows. The cunning barrister began his questioning in an attempt to find out the truth – starting from afar and proceeding to reel his prey in with great care. Ramkanai then turned to the judge and said respectfully, ‘My lord, I am old and very weak. I do not have the strength to talk a lot. Let me say what I have to. My brother the late Gurucharan Chakravarti left all his property to his wife Madam Barodashundori by legal will at the time of his death. I wrote it out and he signed it with his own hand. The will that my son Nabadwip Chandra has submitted to this court is false.’ He fainted having said these words. The clever friends of the imprisoned Nabadwip decided after much discussion that the old man must have been frightened into doing such a thing, he had lost his head in the witness stand; a more complete fool would be hard to find in the city. When he came home, Ramkanai became feverish. Soon this stupid, unnecessary, man who had managed to ruin all the plans of others died, calling for his son in his delirious state. Some of his relatives said, ‘It would have been best if he had gone a few days earlier.’ But I do not wish to say who these were. This entry was posted on May 2, 2013, in Short Stories and tagged রামকানাইয়ের নির্বুদ্ধিতা, Rabindranath Tagore's short stories, Ramkanai's Folly.